Where in the world is Dunnellon Florida?! It’s not that far. 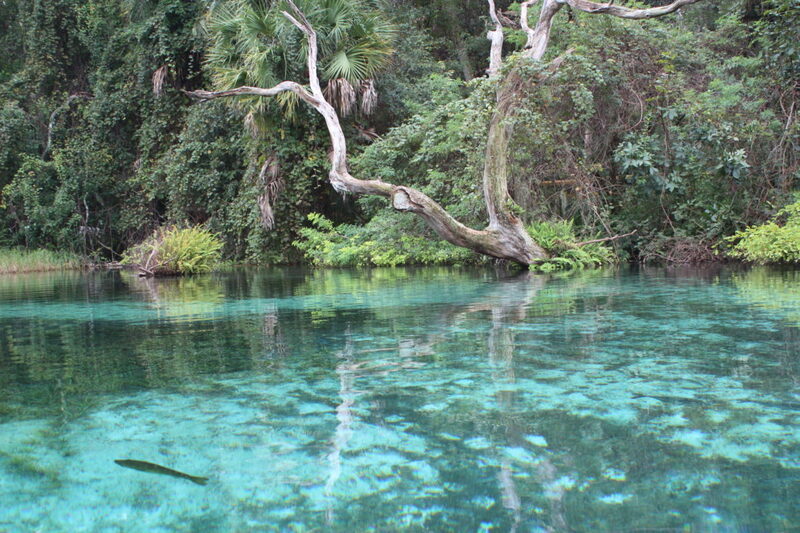 It’s actually only one hour from Orlando, and it’s got a STUNNING spring called Rainbow Springs Florida. It’s the 4th largest spring in Florida. And good news! There’s usually not many people there at all. Because it is a full one hour car ride away, this dissuades pretty much ALL tourists. (A good thing, dear readers.) There are 2 options for Rainbow springs. You can take a tube ride down the river for about 2 hours. Tubing starts with a check-in at the counter, then a ride from a park ranger in a mini-bus. You park near the tubing entrance for Rainbow Springs. There ARE alligator along the way sometimes, so don’t float too close to the edges. Of course, the park rangers tell you they haven’t bitten anyone in 40 years. But I had the experience of having my friend (a terrible swimmer) leap off her tube in fear and nearly drown when she bumped into a nice 8 foot gator on a log. This is a great little float trip for STRONG SWIMMERS. I’m sure the gators won’t bite (well, mostly sure), but I just don’t recommend it for any group with weak swimmers. If you are iffy on swim skills, get a kayak or a canoe. This is SO beautiful. It’s like the glassy clear blue water you see in the picture of Aruba advertisements. I highly recommend. it. There are also picnic areas, nice bathrooms, and waterfalls you can hike to. (I was recently told the waterfalls are man-made, but they’re still lovely.) This section of Rainbow Springs attracts more people, but doesn’t feel overwhelmingly full. The water is cold, but not painfully cold. And it’s usually so blasted hot in the sun after an hour, you’ll find it refreshing. Dive in, swim around, they head back to the grassy green valley area and have a picnic. It has a serene nature feel that feels like Florida now or 100 years ago. Hi there! I love your blog. We just moved to Orlando from San Antonio where we loved floating the rivers and all outdoorsy activities. We just learned about the amoeba problem here in the summer in the lakes and ponds. Are the amoebas something to be concerned with at Rainbow Springs? Also, any tips for dog-friendly parks or hangouts? I’d say avoid swimming in lakes May – September in Florida. Springs however are kept cold year round so usually aren’t as dangerous for amoebas. The Cross Seminole Trail is fun with a dog. (Or you can pick out a section of it nearby where you live.) It is 22.8 miles through Seminole County.